Vermont Sen. Bernie Sanders, who visited Oregon twice in the past month, won the state's Democratic primary over Former Secretary of State Hillary Clinton. By 9 p.m., Sanders had about 51 percent of the vote and Clinton had 46 percent. Sanders led Clinton by about 20,000 votes, 194,141 to 173,198. Clinton and Sanders are vying for Oregon's primary delegates. Ella Ann Dawley, 24, of Portland changed her party affiliation from unaffiliated to Democrat so that she could vote for Sanders. Oregon has 61 delegates up for grabs in the Democratic race. Forty-one of the delegates will be distributed by proportion of the vote in the state's five congressional districts. The other 20 will be distributed by the proportion of the statewide vote. 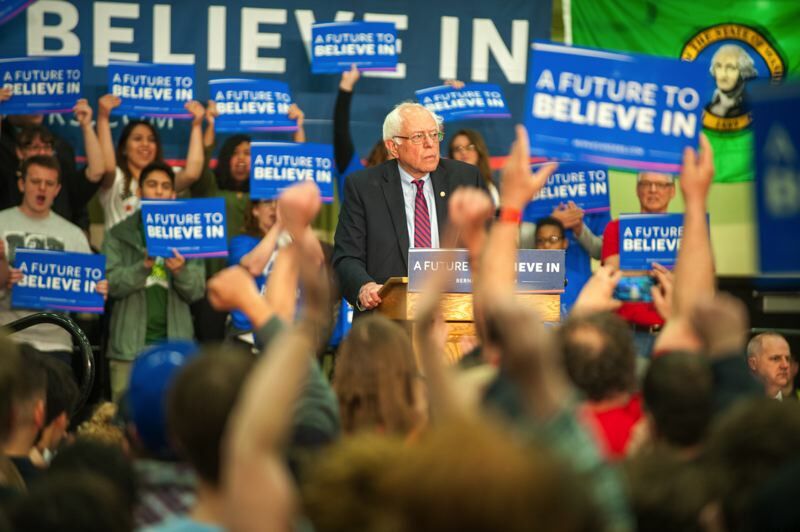 Political analysts initially projected that Sanders would do well in Oregon. The Independent Vermont senator drew huge crowds at rallies in Portland, Springfield and Salem. In contrast, Clinton has not visited the state this election cycle, instead sending her husband, former President Bill Clinton, to stump for her in Portland and Bend. Clinton supporters were disappointed, but still held to the belief that she would be the eventual nominee, winning enough delegates toward that goal. “At the end of the night, it was not so much about the win in Oregon, but that we were really able to rally,” said Sam Safirstein, a volunteer in Clinton’s campaign and a sophomore at St. Mary’s Academy in Portland. “I think she will do really well and will get the Democratic nomination, which in the end is what will matter for us. “We were able to predict Bernie would win. I was disappointed, but Hillary won Kentucky tonight and that will help her in the long run." A poll by Portland's DHM Research earlier this month, however, cast doubt on Sanders’ chances in the primary. The poll of 901 likely voters indicated Clinton was ahead of Sanders 48 percent to 33 percent. With higher voter turnout, the poll showed the disparity could narrow to 45 percent for Clinton and 38 percent for Sanders. The poll, commissioned by Oregon Public Broadcasting and Fox 12, had a 5.6 percent margin of error. Sanders responded to the poll by hitting the phones, talking to Oregon PUblic Broadcasting, OregonLive and at least one television station, conceding that his hopes for victory in Oregon hinged on a huge turnout. Secretary of State Jeanne Atkins projected receiving 1 million ballots by deadline, which hasn’t happened since the 2008 primary contest between Barack Obama and Hillary Clinton. “Like this year’s primary, the 2008 election included an open presidential race and competitive statewide primary races,” Atkins said. John Horvick, political director at DHM Research, said the state’s closed primary system could have prevented some of Sanders’ support from materializing. Only voters who are registered as Democrats are allowed to participate in the party's primary. Outcomes in other states with closed primaries foreshadowed an uphill climb for Sanders in Oregon. Sanders lost every other state with a closed primary. “There is enthusiasm for Sanders in Oregon, but a lot of it is coming from unaffiliated younger voters rather than older Democrats who tend to turn out for the election,” Horvick said. The closed system excluded nearly 500,000 unaffiliated voters and 160,399 members of third parties from helping to decide the presidential nominees for the Democratic and Republican parties. John Opdycke, president of Open Primaries advocacy group, said Oregon’s closed primary is regressive, especially in light of the state’s progress toward increasing voter access with vote by mail and automatic voter registration.